The name Sulhamstead (there is no 'p' in middle) means 'Narrow Valley Homestead' and was given to the area by the first Saxon settlers. There is supposed to have been a Danish Camp of some sort there during the troubled times just before and during King Alfred's reign. The place has always, traditionally, consisted of two manors with two separate villages and parishes: Sulhamstead Abbots and Sulhamstead Bannister. They were only united in 1782. The main village is in Sulhamstead Abbots, although the church is some way to the south. This is now the parish church for both manors. Once dedicated to St. Bartholomew, it may have been rededicated to St. Mary during the time of the plague. It has a fine Norman font. A plaque in the church remembers Robert Venn, the man who improved and hybridized the potato in the century that saw the tragedy of the Irish Potato Famine. He lived at Cottage Farm which was later transformed by Edwin Lutyens into the fine arts and crafts style 'Folly Farm' of today. Sulhamstead Bannister is split into two parts. The Upper End is the central part of Sulhamstead Bannister. Straddled by Sulhamstead Abbots on both sides, the area is now little more than a farm alongside the old churchyard. Detatched, near Grazeley, between Burghfield and Stratfield Mortimer, is Sulhamstead Bannister Lower End, which still retains the parish name today. It’s a strange situation. Banister was the name of the Lords of the Manor from the early 12th century. They were still holding lands here three hundred years later, and had another important manor in Finchampstead. The Upper End was, however, often called Meales and Meales Farm, a reputed manor, stands next to the site of Sulhamstead Bannister’s Church of St. Michael from which its name derives. The last church was pulled down in 1966, but some of its fittings can still be seen in the churches of Sulhamstead Abbots and Ufton Nervet. It wasn’t a very old place, having been built by the Lords of the Manor in 1914 to replace a charming little church only a hundred years older. For a very short time, the two stood side by side. The Rector of Sulhamstead Bannister in 1625 was the father of Sir Samuel Morland, an inventor who demonstrated a calculating machine, a speaking trumpet and various pumps and engines before King Charles II. However, he was particularly famous for having sorted out the plumbing at Windsor Castle! The Abbots were the Abbots of Reading, for the Abbey there owned the manor throughout the Middle Ages. Their old manor-house survives in Brazenhead Cottages (named after the door-knocker), a fine old timber-framed place on the edge of the village. It was apparently favoured as their Summer Residence, presumably because of the river. 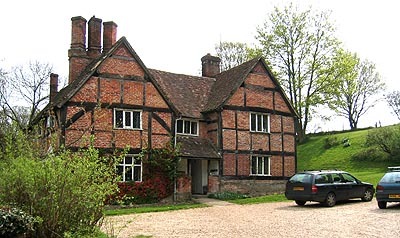 Along with Burghfield, it was purchased by John, Lord Williams, after the Dissolution of the Monasteries and he kept the house as a hunting lodge before renting it out to the Weldon family. The Weldons entertained Queen Elizabeth I there and delivered to her some important news from Ireland. As a reward, she granted them a coat of arms. The hilltop Sulhamstead House later became the local manor house. It is now the headquarters of the Thames Valley Police. This beautiful white porticoed building is easily seen from down on the A4. It is reputedly a twin to Beenham House across the valley. Sulhamstead was built by Daniel May between 1744 & 1748, just after his marriage to one of the Tippings from Woolley Park. Daniel’s father, Charles, had bought the manor from Lord Williams' heir, the Earl of Abingdon, in 1714 having made his money brewing beer in Basingstoke. He became the Mayor there, but lost his life and most of the May family in a smallpox epidemic. Hence, when Daniel died childless in 1753, there were no Mays to inherit and Sulhamstead passed to his young nephew, John Thoyts, whose family lived there until 1910. They united the two manors of Abbots and Bannister in 1774. Their arms appear in a stained glass window in Sulhamstead Abbots Church and two hatchments can be seen in Ufton (though the memorial plaques below them are the wrong way round). The Old Bath Road (or A4) has, of course, played its part in shaping Sulhamstead. The 'Three Kings - Jack’s Booth' was a pub with an unusual and famous name that has recently (and regrettably) changed. The suffix is said to stem from Jack O’Newbury who used to hold business dealings at the pub on his visits to Mid-Berkshire. Alternatively, Jack Jones, the local innkeeper became well known for arranging fist-fights at his establishment. Thomas Stackhouse, the Vicar of Beenham, was a regular in the 1730s and he wrote his famous, 'History of the Bible' there. It was also a stop off point for the famous 'Flying Coach' which travelled between London and Newbury in twelve hours flat.